33' to Alaska: Thursday, July 23, Behm Canal, Very Neet! Thursday, July 23, Behm Canal, Very Neet! Hey, did you see our new boat? We traded ours in yesterday! The boys really liked the helicopter! How much do you suppose it costs to fill that baby with fuel? 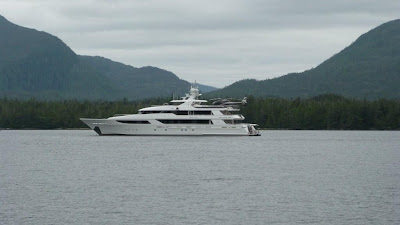 We did see one of Paul Allen’s yachts in Ketchikan…the Me’duse. I’m not sure if he still owns it or not. It’s always kind of fun to google the name of some of these mega-yachts to see who owns them. This morning, its pouring rain! We’re anchored tightly in a little bight in Blind Passage. Val’s making corn bread for breakfast. We’re comfy and cozy inside. The dogs have to go potty though and the boys are still sleeping (at 10AM) so I guess, I’m going to have to leave my comfy abode for the sake of my furry kids. I’ll be right back. After de-watering the pooches, I stopped to pull the crab trap. We thought we’d try again as the crab craving outweighed the frustration of getting skunked. Yes! I got two nice males and a slimy sun star. I’m thrilled. Back on the boat again; warm coffee at hand… Yesterday, we left Ketchikan mid afternoon and headed north to circumnavigate Revillagegiddo Island through the Behm Canal. We saw a bunch of fishing boats along the way so we stopped and caught two more salmon. We really don’t need any more but this fishing thing is in our blood. They were Pink Salmon and not that big so we kept on cruising into Neets Bay. 8 years ago, Val and I had taken a shore excursion here with my folks. We took a sea plane to the head of the bay to watch bears feast on salmon. We weren’t sure if we could take our boat here or if there would be bears but we thought we’d give it a try; if nothing else, it’s a beautiful cruise along the way and not that far off our planned route anyway. We got to the head of the bay, where there was an operating hatchery. The guys there were nice enough to let us tie up to their dock, saving us from having to anchor and launch the dinghy. Pepper spray and cameras in hand, we set out to find the creek and, hopefully, the bears. We just got off the dock before we saw our first bear on the beach. Cool. Within minutes, we saw another one. Very cool. 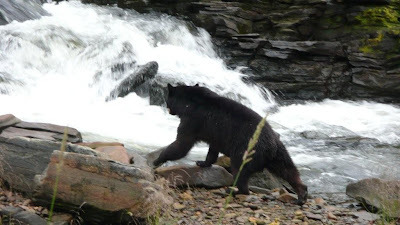 As we walked, the second bear started heading towards our trail. I was really glad we left the dogs on the boat (although Lucky ate a whole pack of orange gum while we were gone!) We weren’t sure where he went so we walked cautiously. All of a sudden, the bear heard us and bolted out right in front of us and ran across the trail. 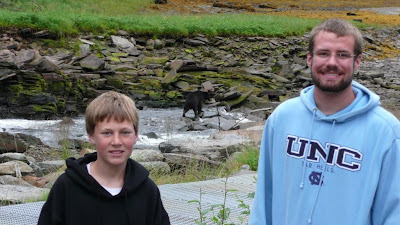 He looked like a young black bear and I think he was more scared of us than we were of him. I took the strap and cover off my pepper spray, just in case. 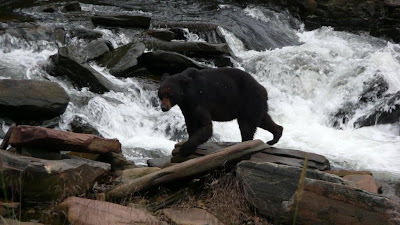 As we neared the creek, there were a couple more bear; maybe the same ones, who knows. We watched them pounce for salmon, eat grass, and lollygag around. Sherlene, a bear naturalist approached us, and introduced herself as the excursion guide. They’re still running the shore excursions up there from Ketchikan. 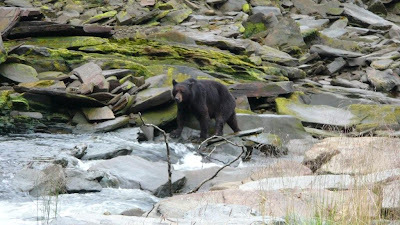 The last tour had just flew off and we had the creek and the bears to ourselves with our own personal bear naturalist. How cool is that? Sherlene did a great job making us feel welcome and explaining all about the bears, salmon, etc. Cody and Connor really enjoyed themselves and Val and I were so glad we could experience this again and see it anew through their eyes! By now, it was 6:30 and we hadn’t even thought about an anchorage yet so we reluctantly said goodbye to Sherlene and the bears and set off to find a safe little cove to drop the hook. We cruised about 12 miles and found a tight little inlet with a bight that we could tuck into. Cody got the grill set up. Connor launched the dinghy and did dog duty. Val grilled Pink Salmon and King Salmon. We did taste tests. Although we all preferred the King, Cody and I didn’t think there was much difference, mostly just in texture. Mom thought the difference was more substantial. We all would have been plenty happy with the Pinks. I think they’re going to smoke up just great. As we cruise, we can see salmon jumping in the air at almost any time. I think they’re all pinks. We could catch them all day long. We’d rather catch Kings, Sockeye, and Coho. We’re all feeling very blessed to just to be here catching anything in this beautiful place. No one is complaining…just hoping for that big trophy prize fish, you know! Well, the boys are up now. On the way into our anchorage last night, we saw a little forest service cabin we’re going to go check out. Hope it quits raining soon.